In the 1860s, as Milwaukee’s original founders passed away, a group of early settlers came together to revive their former ties and preserve the area’s history. On July 5, 1869, the group held its first meeting, inviting any citizen of “good moral character” (later only men could belong) who had settled in Milwaukee prior to January 1839 to join. Over time, they broadened membership requirements, allowing new members to join if they lived in MILWAUKEE COUNTY for thirty years or more. As the city grew and changed, the Club collected books, pictures, and relics of early Milwaukee. They also held annual picnics, built memorials honoring community founders, and issued plaques commemorating historical sites in the city. ^ H. Russell Austin, The Milwaukee Story: The Making of an American City (Milwaukee: The Milwaukee Journal, 1946), 115. ^ Frank Flowers, The History of Milwaukee, Wisconsin: From Pre-historic Times to the Present Date (Chicago: The Western Historical Co., 1881), 145; Milwaukee County Old Settlers’ Club: Its Origin, Purpose and Aims; Amendments to Articles of Incorporation and Revised By Laws of 1889 (Milwaukee: Old Settlers’ Club, 1891), 19. ^ Milwaukee County Old Settlers’ Club, 146. By 1881, the Executive Committee had resolved that all male descendants of those who had settled in Milwaukee prior to January 1, 1843 who were of good moral character would be eligible for membership after they reached the age of 21. The Executive Committee would recommend such men on an individual basis for membership. This widening of membership requirements resulted in a number of the actual early settlers starting a different pioneer club that would only allow members of the original settler community to join. 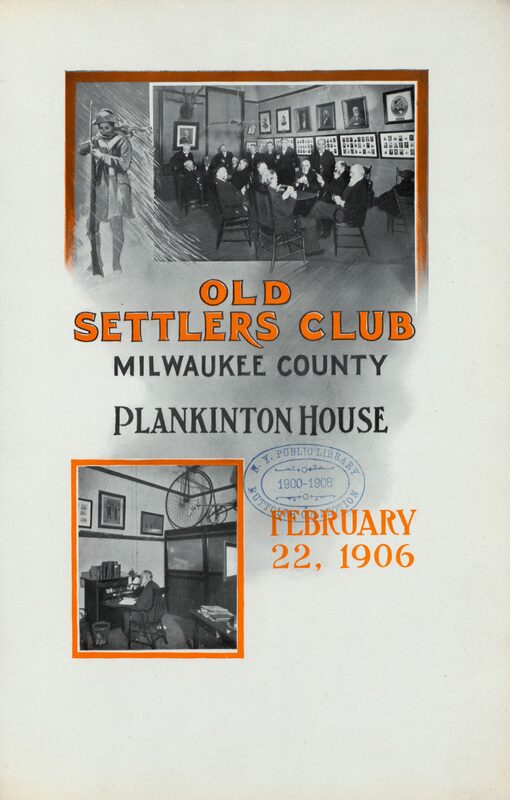 The Early Pioneer Association of Milwaukee County recognized that, like a true pioneer association, their club would cease once its members had died, Milwaukee County Old Settlers’ Club, 151. ^ Old Settlers’ Club of Milwaukee, Early Milwaukee: Papers from the Archives of the Old Settlers’ Club of Milwaukee (Milwaukee: The Club, 1916), 6-7. Annual banquets held on Washington’s birthday were celebrated in historic buildings like the Newhall House, Kirby House, Pfister Hotel, Plankinton House, National Soldiers’ Home, and Hotel Wisconsin. They built a log cabin as a memorial on the site of Jacques Vieau’s former residence in Mitchell Park, and secured a memorial for Professor Increase A. Lapham in Lapham Park. Plaques were placed on the Milwaukee County Court House (on Jackson Street), the Pabst Building, Solomon Juneau’s first home, the Uihlein building (which marked the birthplace of the first white child in Milwaukee), and the First National Bank building (marking the birthplace of the first white boy in the city). Flowers, Frank. The History of Milwaukee, Wisconsin: From Pre-historic Times to the Present Date. Chicago: The Western Historical Co., 1881. Old Settlers’ Club of Milwaukee. Early Milwaukee: Papers from the Archives of the Old Settlers’ Club of Milwaukee. Milwaukee: The Club, 1916.